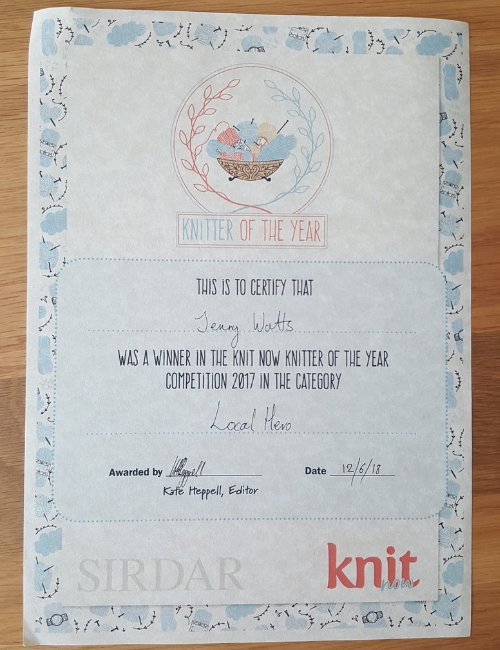 Jenny, one of the Ammonite Yarns owners, was voted a Local Hero in the Knit Now magazine ‘Knitter of the Year Awards’ 2017, thanks to a customer who had been particularly impressed by the service received. 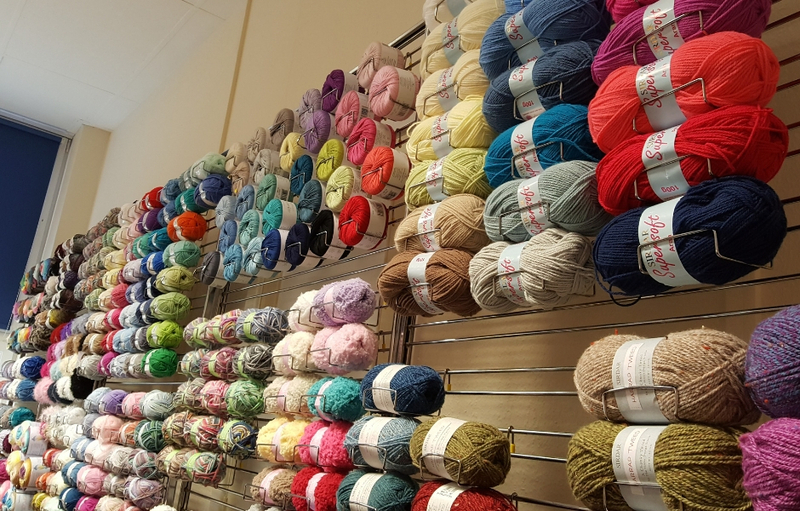 The prize was a day out at the headquarters of Sirdar, the famous British yarn company, on Tuesday, 12th June 2018. Unfortunately, as Tuesday is always a very busy day at the shop (with both drop-in sessions taking place), Jenny couldn’t make it and suggested I should go on her behalf. As you can imagine, I was happy to oblige! After a pleasant train journey the evening before (although no Wi-Fi on CrossCountry trains was a bit of an unexpected blow!) and a night in the Wakefield Holiday Inn hotel (very nice room, but very noisy pub just under my window), it was time to discover a place that not many knitters and crocheters can dream of ever entering. At first sight, the whole place looks very brown. There’s a gate at the entrance of the site and you need to be buzzed in. The compound used to be fully occupied by Sirdar (spinning used to be done on-site, before it became financially unsustainable), but now the yarn company uses only a couple of buildings, for its warehouse and offices. After the brown uniformity of the outside, everything brightens up in the reception area, where sofas garnished with knitted cushions await the wary traveller and a few knitted garments and accessories are on show on a low podium. We were welcomed by Kate Heppell, editor of Knit Now, and Amanda Paul, Account Manager at Practical Publishing. Not having won any prize myself and not being much of a knitter, I felt a little bit out of place, as I was surrounded by prize-winning knitting experts, but I was made very welcome all the same. 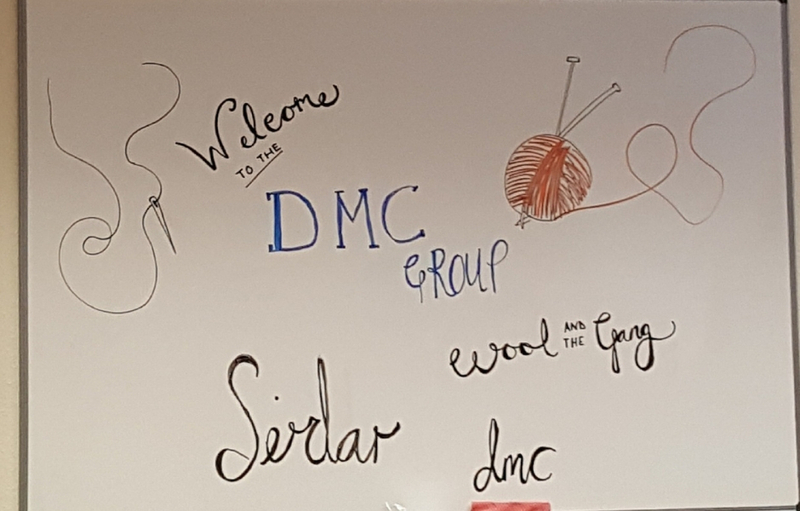 Once we were all there, we were taken to a meeting room that made us all green with envy: walls lined with a ball of each yarn made by the DMC Group, which consists of DMC itself, Sirdar (and its sub-brands, like Sublime and Hayfield) and Wool and the Gang (now that was a surprise, as we all thought they were an independent brand, but I guess it makes sense to go under the umbrella of a large company once you’ve grown). The first thing we did was to visit the warehouse. Darren, the warehouse manager, made us follow the journey of the yarn after its delivery on site. Indeed, any actual spinning has stopped there since the beginning of the century. However, a factory in Turkey bought the machinery and provides about 80% of the yarn sold by Sirdar. Some of the old factory floor employees stayed on and are doing a different job within the company (you can usually tell who they are, as their eyes mist over a little when they start talking about “the manufacturing days”). After arrival, all the yarn is checked, entered into the computer system, and first put away in a temporary storage room. 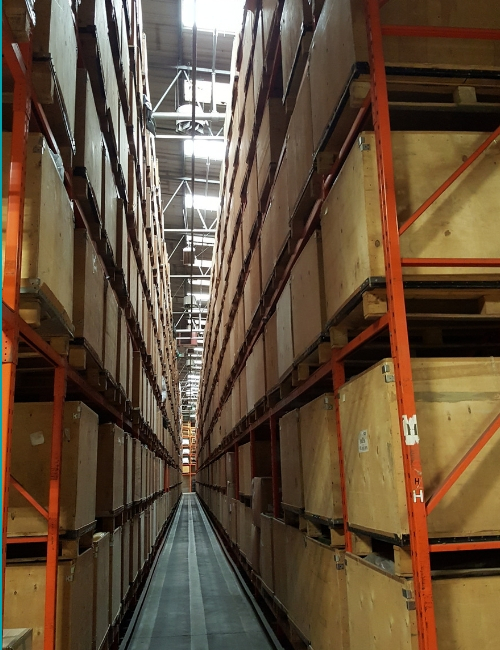 Walking between the very tall shelves, stacked high up to the ceiling with massive crates of yarn that could easily fit at least a couple of people, was a rather eerie experience (it made me think of the Hall of Prophecy in Harry Potter and the Order of the Phoenix). Our guide gave us some figures but I couldn’t repeat any of them – all I can tell you is that it was mind blowing! Later on, the yarn is stored in a more open, less daunting picking warehouse (think of a system similar to the IKEA self-serve area, with aisle and location numbers). There, the crates are open, and as we walked past we could finally indulge in some shameless squishing (albeit through a layer of plastic, as balls are not sold individually). All the processes mentioned so far are done by human beings – no automation in sight. 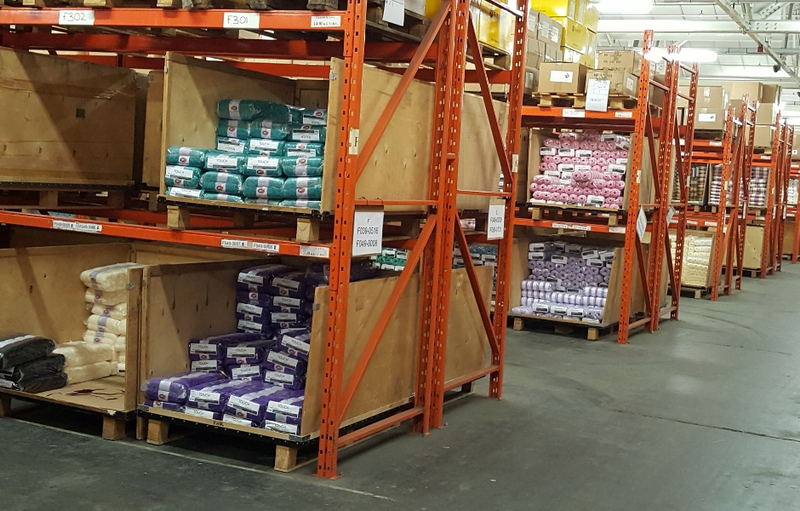 The preparation of orders is also done by Sirdar employees who walk around the warehouse with a shopping trolley and a pick list. The first machine we encountered was the special conveyor belt on which orders (which have been picked, double checked and triple checked) are heat sealed in a plastic bag before being loaded onto a van, ready to be dispatched. 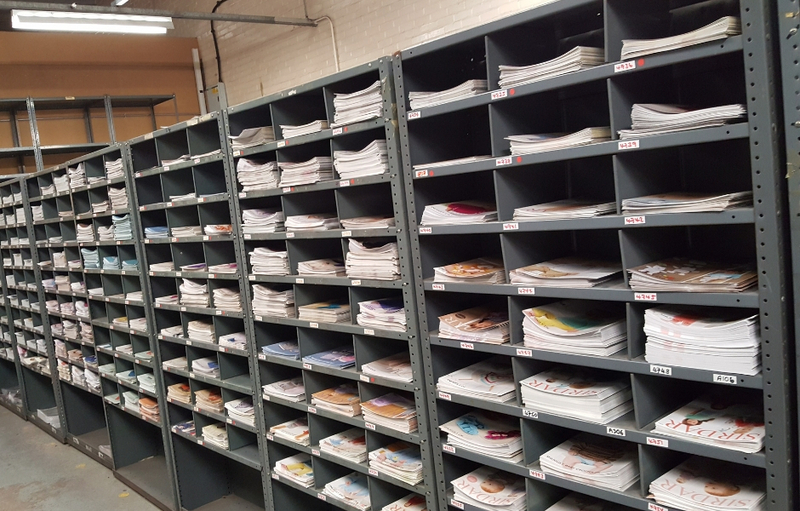 We were also taken to the printing room where Sirdar prints its own patterns, more or less on demand (there is a little bit of stock, but not as much as you’d expect). This gives Sirdar more flexibility than ordering them from a contractor in large quantities, especially in case of sneaky typos! Sirdar does not make its patterns available online, but exclusively in print, via yarn retailers (Sirdar doesn’t actually sell any of its products directly to the end consumer). The next stop of our tour was the design room. Picture a dozen or so ladies sitting at desks, but not typing away on computers: knitting and crocheting! As the tour was mostly focused on knitting, I had to be the one standing up for crochet and asking some burning questions. Julie, the head designer, acknowledged that Sirdar specialises mostly in knitting, with about 90% of its patterns being intended for 2 needles, and only 10% being crochet patterns. However, the company is currently trying to catch up with the renewed enthusiasm for crochet (yay!). Julie didn’t seem overly keen on crochet patterns herself and explained that because crochet stitches tend to be taller than knitting stitches, it makes sizing variations more difficult to get right than when designing a knitted garment. 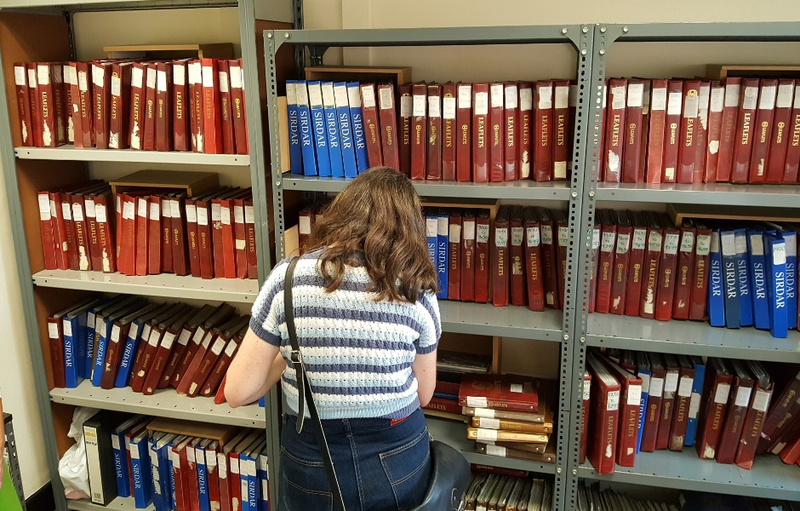 Before lunch we popped over to the archive room, which was much smaller than I expected: basically an office with half a dozen shelves stacked with binders containing every single Sirdar pattern ever issued. We had fun browsing through a few of the binders and laughing at some of the ridiculous outfits that were deemed fashionable in the 70s. After lunch, we were allowed in a very secret place: the Sirdar showroom (it’s so secret that we were not allowed to take any pictures!). It is where the next season’s collection of garments and accessories is presented. 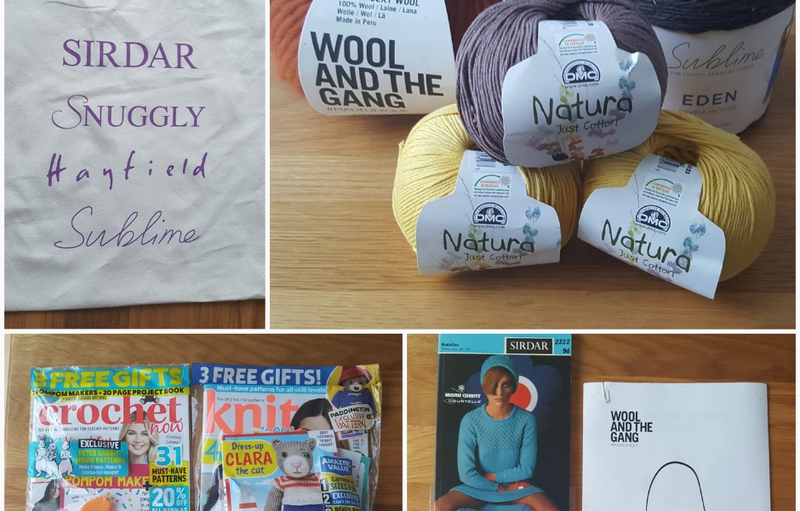 Members of the Sirdar marketing team talked us through the yarns used for each item and whether they were old favourites or brand-new offerings. We also had a chat with a product manager, who is in charge of agreeing on the look and feel, the composition, etc. of yarns with the manufacturers. It was interesting to learn that yarns with big stripes are roller printed, whereas marled and variegated yarns (up to 6 colours) are spray dyed. I also discovered that individual strands of yarn are first plied together, then printed, before going through a steaming process and finally being balled. We were then treated to a presentation by Kate Heppell, the editor of Knit Now, who explained how a knitting magazine is put together. Penny Jenkins (aka A Woolly Yarn), one of my fellow guests that day, wrote about it most eloquently. Last but not least, we were given goody bags! We were all very excited about the different yarns (although we didn’t all like the colours we had, so some swapping ensued) and other gifts, particularly a notebook with a vintage pattern book cover. Our lovely day drawing to an end, we all returned to the reception area to take our leave. Amanda stayed behind to make sure we all got on our way safely… and I’m glad she did! My taxi never turned up, so eventually, Amanda gave me a lift to the station – and an extra knitting magazine that happened to be in her car! – Penny Jenkins, already mentioned above, who writes the brilliant blog A Woolly Yarn. – Tracy Holroyd-Smith, organiser of the Leeds Wool Festival, hosted by the Leeds Industrial Museum at Armley Mills. – Heike Campbell, a designer of gorgeous knitwear. – Emma Heywood, a knitwear designer obsessed with cute and quirky intarsia. Finally, thank you Jenny for giving me such an amazing opportunity to take part in this very special day!